Hey, hey! 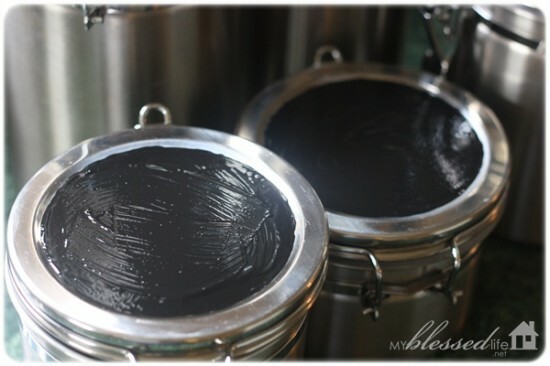 Today, I’m sharing a super easy way to customize kitchen canisters with chalkboard paint. I’ve had these stainless steel canisters since my hubs and I got married six years ago. I never used them regularly because I couldn’t ever remember what was in each one. What a pain! After I made my Spring Wreath, I had leftover chalkboard paint, so I got busy on my canisters with a sponge brush. I didn’t tape anything off. I just went around the canister top carefully with my paintbrush. Easy peasy! I did three coats of chalkboard paint and let it dry completely between each coat. After allowing the paint to cure for a day, I used chalk to condition the paint. I scribbled it on and then used a soft rag to wipe it off. I used a Chalk Ink Wet Wipe Marker to write the ingredients on each canister. That’s how I customized my kitchen canisters. It was a very easy project. I just had to be patient to let the paint dry and cure. 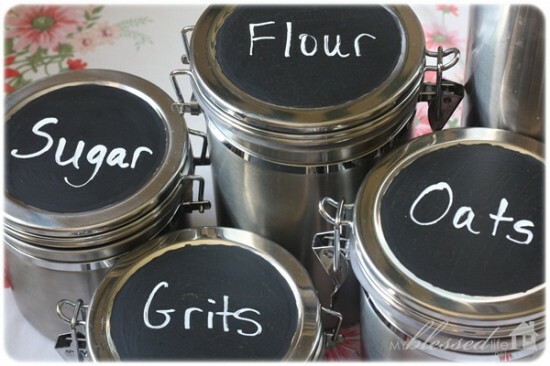 If you have other styles of canisters, you could always tape off an area and add chalkboard paint to the canister side. SO many possibilities! Next up, I’m working on my spice rack…hope to show you soon! 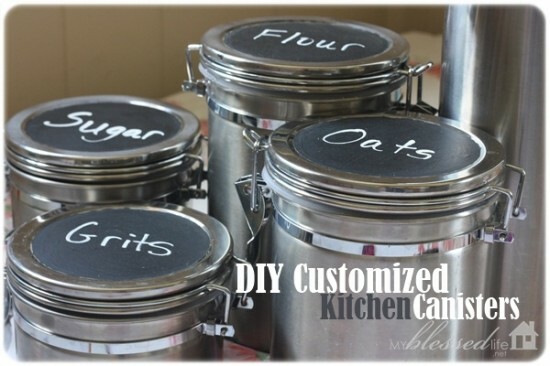 Do you have kitchen canisters? Do you have them labeled? I’m linking up to I’m Lovin’ It, Weekend Wrap Up Party, Today’s Creative Blog and Tip Junkie! These are so cute! 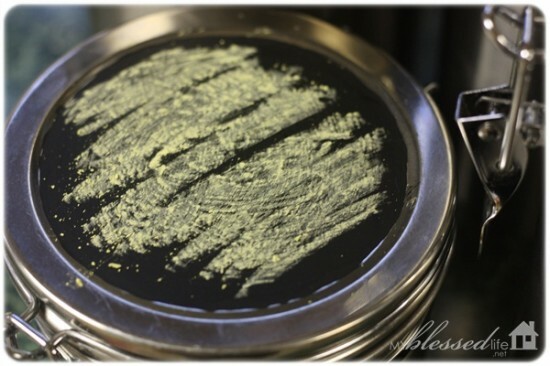 I love the idea of using chalkboard paint but don’t like the actual chalk and the chalk dust. I’ve never seen those chalk markers before. Where are they available for purchase? Johanna´s last blog post ..Productivity Tip: Stop Multitasking! So cute! And I love the fact that one of your canisters is marked for grits! You know a family loves grits when they have a container or jar of them sitting out in their kitchen with their other staple ingredients. 🙂 We love our grits also! Yay for grits! 🙂 Do you put cheese in yours? That is so cool Myra! Thanks for sharing. Linda´s last blog post ..Yay!…My Daughter’s Book Has Arrived!!!!!! So fun!! I need to do that to some of our canisters! 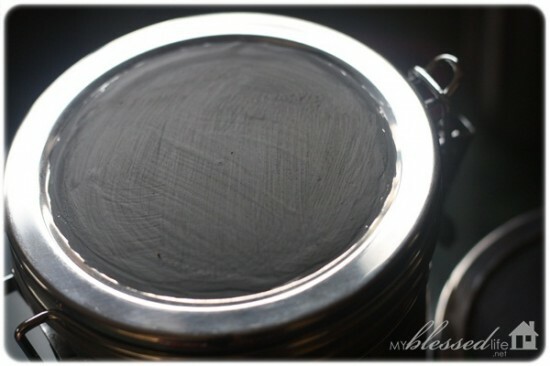 I had no idea you could buy chalkboard paint in the small containers. I have several projects I would like to apply this to. THANKS!! Where did you get the canisters? They were a wedding gift…I think from Target? So cute!! I didn’t know that the chalkboard paint came in the small bottles like that!! I’m so looking for it at Hobby Lobby next time I am there!! I have dark green canisters that look just like yours. This is a great idea for helping the hubby know where everything is. Thanks for the inspiration! For some reason my Hobby Lobby is behind. They only have spray chalkboard paint and they don’t have these chalk markers. I checked Jo-Ann too and they don’t have them either. Bummer! Hobby Lobby did have some cute canisters though! I have been really enjoying seeing all the different uses for chalkboard paint and I have to say that those pens are really neat. I want to do something like this now so neat! I love, love, love these! I just revamped a spice rack I had around and I LOVE having it all organized and labeled. I have some glass canisters that I’m not using…maybe I will put some chalkboard paint on those and do something similar?!? Thanks for the great idea!! 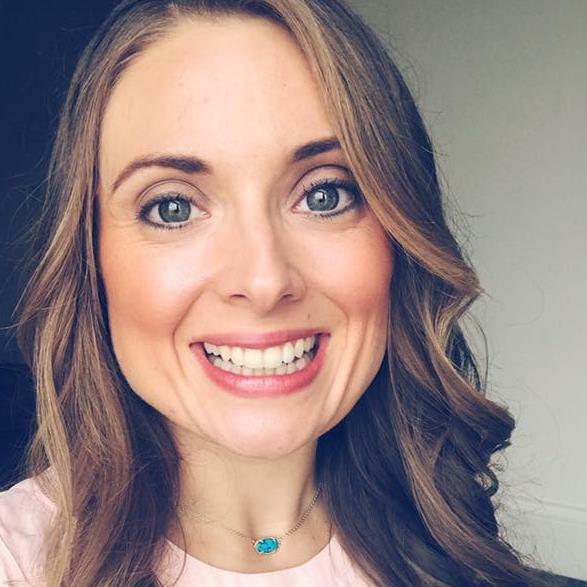 Katie´s last blog post ..My Favorite Spring Desserts! Yes! You could totally do this on glass! Hope you’re having a great week! LOVE!!!! 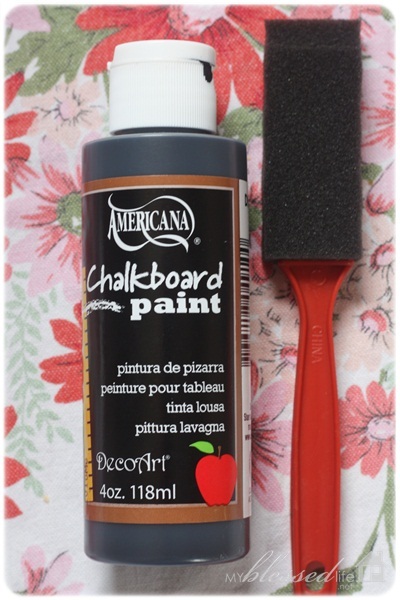 I got the chalkboard paint at Walmart but they didn’t have the chalk pen:( Will check the craft stores this week. I have clear canisters that look like yours Myra. They are a shaterproof plastic. Do you think the paint will go on ok or should I prep it with sandpaper? Very cute idea….I may have to steal it for my craft room! 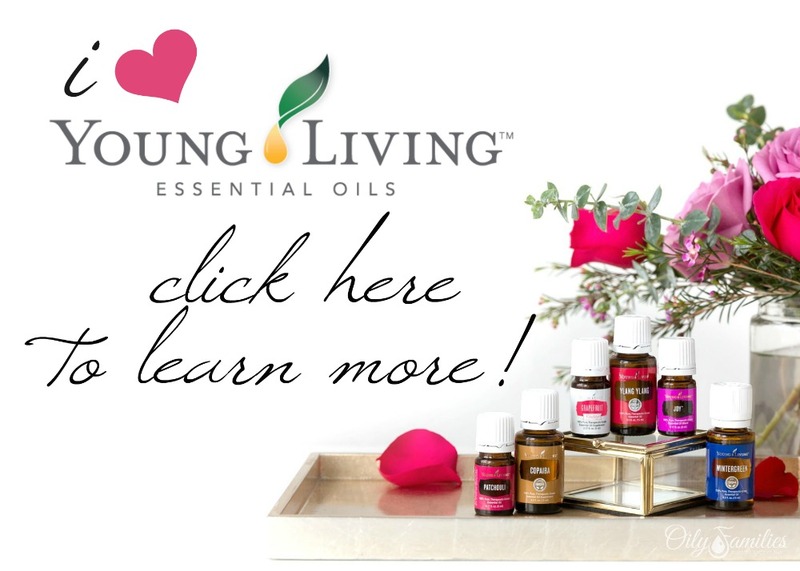 Heather´s last blog post ..Extraganza ~ Day 9 ~ Let The Cleaning Begin!! Those look great! I love the chalkboard labels! Onna´s last blog post ..Blog Party! So glad I came across this post! 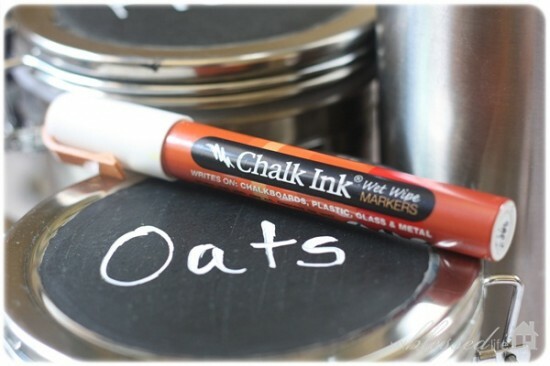 I’ve been wanting to do a chalkboard project and love the chalk ink markers! Just what I need!